You have four days – India, Ink. 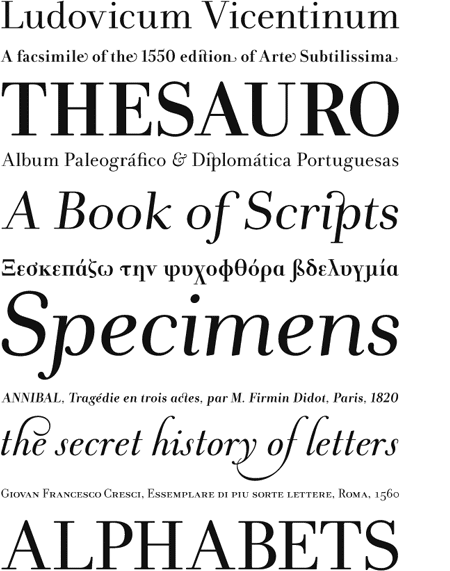 to glut yourself on Dino dos Santos’s typefaces at half price. The sale ends on Tuesday. Run! Mind you, these are lovely and useful typefaces that are inexpensive to begin with; at 50 percent off, they are scandalously cheap. Many are available in very complete (small caps! Greek! kooky ligatures!) OpenType versions. Two of them—Estilo and Esta—were picked for Typographica.org’s best of 2006 annual roundup. Leitura is a superfamily including sans, serif, news (! ), display, headline, and symbols—you may never need another font! Volupia is adorable and costs less than $10! Albo, suitable for all your metal band posters, is only $15! There is truly something for everyone. In short, you are a sucker if you don’t take advantage of this sale. No, I will not tell you how many fonts I just bought. I’d be a fool not to. Wow, these are great typefaces. Yes, and there are a lot of them—Mr. dos Santos has been very busy. Now I will have to get busy doing some freelance work for a while, so I can justify (not to mention pay for) my purchases.